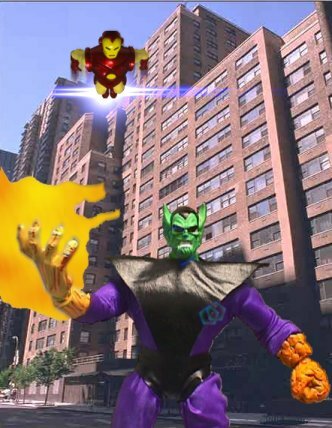 The Super Skrull is a highly modified Green Goblin head on a Hulk body. The "Thing" fist was made by putting globs of "Magic Sculp" onto the Hulk's left fist, then painting the mess with an orange acrylic. Gobby's hat was cut off, and the back of his head filled in with "Magic Sculp," then colored black with a "Sharpie" permanent marker. His smile was turned to a frown with "Magic Sculp", his face painted with acrylics, and his eyes re-colored with "Sharpie" permanent markers.